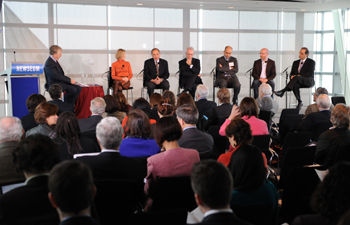 Ted Koppel moderated a discussion on public diplomacy in the modern media age, "Media as a Global Diplomat." Photo by the United States Institute of Peace. “What is public diplomacy?” was the first question that Ted Koppel posed at the recent Media as a Global Diplomat conference attended largely by public diplomacy professionals. I was surprised that the panelists, including the outgoing Undersecretary of State for Public Diplomacy & Public Affairs, couldn’t readily agree on an answer to this foundational question. Knowing this, it becomes unclear which concept was being trivialized when Koppel compared diplomacy to military music. Public diplomacy is a practice that is poorly understood and poorly funded — but it’s of considerable consequence, especially in the digital age. Public diplomacy…deals with the influence of public attitudes on the formation and execution of foreign policies. It encompasses dimensions of international relations beyond traditional diplomacy…[including] the cultivation by governments of public opinion in other countries…[and] the transnational flow of information and ideas. The practice of public diplomacy has evolved significantly with the emergence of digital media technologies, but based on my conversations with people in this field, the meaning of the term has remained largely intact. View the entire panel discussion in this YouTube video. As a digital media strategist with professional roots in national politics (where foreign policy is a major concern), I’ve had more than a passing interest in this topic. That’s what led me to Washington to attend the “Media as a Global Diplomat” conference hosted by the United States Institute of Peace several weeks ago. At the conference, Glassman continued on the same track, saying, “We can achieve foreign policy goals without people liking us.” (I wondered to which goals Glassman was referring). Contrast these comments with President Barack Obama’s emphasis, articulated in his inaugural address, on “mutual interest and mutual respect,” and his first presidential interview to Al Arabiya television. More than strategic maneuvers, these were illustrative of a new vision for public diplomacy. In my opinion, Koppel was mistakenly conflating direct democracy as a form of government with the increased civic participation enabled by the web. Glassman made a compelling case that the Internet is, in fact, an “American medium,” which gives the U.S. a competitive advantage over it foes, and suggested that America should try to project itself as an “agora” (or “marketplace of ideas”) to the world. While I preferred the “marketplace of ideas” metaphor over the “war of ideas” characterization Glassman had used previously, I thought the idea of the Internet as an “American medium” might have been a little ego-centric. However, after speaking with Darren Krape, a new media advisor at the State Department, and reading his blog, I realized that Glassman’s point wasn’t so much that it was an American medium as that it was a democratic medium. After all, there’s a reason the State Department allows comment threads after its YouTube videos while, for example, Al Qaeda does not. 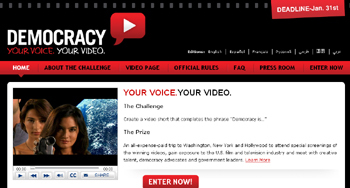 There’s a reason that many other countries would have a hard time pulling off something like the Democracy Video Challenge, a project that allows citizens from any country to define — in their own words and images — what the word “democracy” means to them. America’s enemies exploit a command-and-control style of one-way communications that is anathema to the Internet. And when Oscar Morales started the “One Million Voices Against FARC” Facebook group to organize a march against Colombia’s most powerful rebel group, FARC leaders were, on this medium, defenseless. You can also read the second part of this post, which explores the specter of cyber-terrorism and national security issues associated with public diplomacy.